Technology is helping to standardize dense breast tissue assessments. Legislation in 28 states attempts to bring some level of standardization to notifying women who have dense breasts, and breast density legislation is gaining momentum, with four states recently proposing action. There's nothing standard, however, about dense breast tissue, nor in the way dense breasts are assessed. It's a subjective process, left to the decision-making of a radiologist. Variability in radiologists' assessments of dense breasts, particularly in the "gray area" of classification between dense and extremely dense, was the subject of a study out of the University of Vermont (UVM) published in 2016 in the Annals of Internal Medicine. Researchers found density assessment to be highly variable across radiologists and warn of the implications of relying on subjective measurements for clinical decision-making in breast cancer screening. This is of particular concern, given that 40% of women are found to have dense breasts. "In the past, studies looked at the performance of the technology used in mammography or another imaging modality," says research team leader Brian Sprague, PhD, a UVM cancer center member and associate professor in the departments of surgery and radiology. "When considering sensitivity, conclusions were related to the capabilities of the machine being used. Now, we're looking at other factors that can cause variation in imaging. Breast density is a subjective measure, and we saw the variability across clinical practices." Using data from 30 breast imaging facilities, focusing on community-based practices, the researchers examined variation in the distribution of breast density assessments across radiologists. They found a wide variation across radiologists in the percentage of mammograms rated as dense, ranging from 6.3% to 84.5%. In addition, more than one in six women with consecutive mammograms interpreted by different radiologists during a short period of time were reclassified from nondense to dense categories or vice versa. The study findings reflect both inter- and intraradiologist subjectivity. "We were surprised by the substantial variability and the range difference in variations in dense breast assessments," Sprague says. "Of particular note was variability with assessments among women who fall in the B and C categories, meaning women with areas of density and heterogeneously dense breasts." • breasts are extremely dense, which lowers the sensitivity of mammography. According to the ACR, 80% of women with dense breasts fall in the middle ground of scattered fibroglandular density and heterogeneous density, where the subjectivity of radiologists' assessments can be most critical. "Each woman is different, even if their breast density falls in the same category," Sprague says. "If the same woman has a mammogram read by more than one radiologist, she could receive different results from each one. 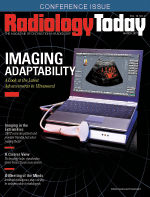 Even the same radiologist could read her image on different days and report different results." Clinical practices are left looking for more objective, standardized ways of measuring breast density and, in some cases, are turning to algorithms and automated software tools for possible solutions—or at least as a "second set of eyes" for categorizing dense breast tissue. Sprague says assessment software could help reduce variability or even provide breast imagers with some guidance. "Ultimately, having an assessment software system should help with the standardization of dense breast categorization," says Jean Weigert, MD, FACR, director of breast imaging with the Hospital of Central Connecticut in New Britain. "There are so many different radiologists who read mammograms, each with different levels of experience. Software can help with accuracy." Weigert and her staff use FDA-cleared VolparaDensity assessment software, which provides objective, volumetric measurements and BI-RADS breast density category assessments. Julian Marshall, chief marketing officer at Volpara, says having both solutions addresses the two challenges presented by dense breast tissue: the masking risk that occurs when density obscures cancers in mammograms, and the increased risk of developing breast cancer due to the higher proportion of dense breast tissue. "The BI-RADS fifth edition and the various state regulations are directed toward identifying masking risk," Marshall says. "BI-RADS asserts that breast composition measurement is about the volume of attenuating tissue in the breast and provides guidance for improving the measurement of breast density, which has been plagued by imprecise, area-based indicators. A recent study showed a strong linear relationship between VolparaDensity and the sensitivity of mammography and is a direct reflection of the masking risk discussed in the BI-RADS atlas." VolparaDensity is compatible with the majority of digital mammography and tomosynthesis systems in operation, with consistent results across brands, models, and modalities, providing complete, objective automation of the breast density assessment process, Marshall adds. Nashua, New Hampshire–based iCAD's PowerLook Density Assessment Software uses an "appearance-based" approach to assessing breast density. According to Kathleen Kelly, vice president of sales for cancer detection, PowerLook, formerly known as iReveal, simulates the process radiologists use to measure breast density. The algorithm identifies dense tissue and then analyzes the tissue characterization and the risk of potentially masking tumors or calcifications. The result is mapped to a density category that corresponds to BI-RADS fifth edition standards. The methodology considers both distribution and dispersion of fibroglandular tissue, with the masking risk correlated to the amount and distribution of fibroglandular tissue. "Our density assessment software looks at the mammography image the same way as a radiologist would look at it," Kelly says. "PowerLook Density Assessment Software identifies dense breast tissue and then goes further to analyze tissue characterization for the dispersion and distribution of the dense tissue and its potential to mask a cancer." In November 2015, Reid Health Breast Cancer Center of Indiana installed PowerLook Density Assessment and radiologists quickly and easily adapted to the new technology. "Now, radiologists are able to produce a consistent and accurate breast density result every time," says Melissa Moles, lead mammography technician at Reid. Kelly sees automated assessment software taking hold with hospitals that operate in states with dense breast notification laws in place, even if the law does not require hospitals and imaging facilities to use assessment software for calculating breast density. Reid is equipped with digital and 3D mammography as well as computer-aided detection software, but, when it came to measuring breast density, Reid did not have the optimal technology they needed. Radiologists were categorizing 75% of patients as having dense breasts, an amount significantly higher than the 40% that is documented in research literature. "Since implementing [PowerLook], our radiologists have been able to provide more consistent breast density results for our patients during screenings. We must consider many aspects of each patient's case at once, but [PowerLook] allows us to focus on our primary goal of finding breast cancer," says Beth Ingram, MD, an interventional radiologist at Reid. "Whether or not a facility is located in a state with dense breast notification laws, we're seeing more and more needs for software like this," she says. "Hospital administrators are reacting to a need for more accurate reporting and are saying that they want standardized results." Along with more uniform results, Kelly says hospital personnel want to ensure that the addition of new tools in the dense breast assessment process doesn't negatively affect workflow. "Once the mammogram is completed, the technologist closes the case and sends the image to a server for analysis," she says. "In about 30 seconds, a score card is generated and added to the patient's report as it appears in the facility's workstation or PACS for immediate interpretation. It then becomes part of the information that is read along with the image." A breast density category assessment tool that's new to the US market is Statlife's DenSeeMammo, software that received 510(k) clearance by the FDA in December 2016. According to Valérie Hélin, vice president of medical and regulatory affairs with the Paris-based Statlife, DenSeeMammo is a visual-based software intended for use with digital mammography systems and is currently compatible with images obtained from GE Senographe Essential systems. "Only the breast density visually assessed by radiologists is recommended by the BI-RADS atlas fifth edition, which is clinically significant considering the masking effect and the correlation with breast cancer risk," Hélin says. "With our software, images gathered via mammography are assessed for breast density by comparing them to a database of images that were previously quoted by a consensus of MQSA [mammography quality standards assessment] radiologists who specialize in breast imaging." On the risk assessment side, Statlife, which also maintains an office in Boston, developed a tool called MammoRisk, which is software that uses data mining to assess a woman's risk of developing breast cancer. DenSeeMammo and MammoRisk are two independent software products and can be used separately but were designed to work as part of an overall system. "When DenSeeMammo is combined with our other software tool, MammoRisk, for breast cancer risk assessment, it provides a breast density category assessment, a risk evaluation, and a patient report with a personalized screening program, all validated by radiologists," Hélin says. Other software developers are addressing ways to enhance mammography images, as a way of seeing through dense breast tissue and finding tumors and calcifications. Swedish company ContextVision offers GOPView Mammo3, image processing software for screening and diagnostic exams in digital mammography. The software provides visibility of lesions independent of breast density. Product manager Ann-Sofi Hoff adds her support to the importance of enhancing the visual aspect of breast cancer screening, saying it's "the most common method" of assessing a woman's risk of breast cancer. "With a focus on dense breasts comes the need to develop ways to help radiologists make better judgments for their patients," Hoff says. "There are situations where breasts are too dense to make effective evaluations. Our software increases the image's contrast and makes the details easier to detect." Despite the scientific nature of an assessment software tool, there's still the option for the radiologist to override the findings, for a number of reasons. "Software can under- or overread an image, and if I think that has happened, I will override the result," Weigert says. "It's not a perfect tool, but I do rely on it and believe that it has improved our credibility." Adoption of assessment software could also depend on the nature of the imager. "There could be a difference between how a breast imaging specialist uses assessment software vs how a general radiologist uses it," Sprague says. "I could see general radiologists always using what the computer tells them, where a breast imager might be likely to override the results." Usage could also be determined by whether the imaging is occurring in a state with mandatory dense breast notification laws, he adds, as well as the standard protocols per practice for when a woman is diagnosed with dense breasts. Weigert notes that any assessment software should be seen as an enhancement to mammography. With that, having a tool that could add a clearer outcome to a mammography image could go a long way toward keeping this "gold standard" breast cancer screening modality in the spotlight. "The message with mammography is, we want to make sure that we provide the most information possible for everyone we see," she says. "If we want to keep mammography as the frontline choice for breast cancer screening, assessment software could help us use this modality to better triage patients and determine the next steps in their screening process."